In this article, we will look at how to prepare for DU LLB Entrance Exam 2018 without going for any kind of coaching. First of all, Interested Candidate must go through the Eligibility Criteria of DU LLB Entrance Exam and if eligible, fill the application form and move next to have a clear understanding of syllabus and exam pattern of different sections in the exam. The below table will give you a fair idea of the exam pattern of DU LLB Entrance Exam 2018. Now let us move to the second most important thing which is the total number of marks. The total marks for the exam are 700. There will be 175 questions in all and each question is for 4 marks. There will be negative marking and 1 mark will be deducted from the total score for every wrong answer. Now I will take you through the section wise DU LLB Syllabus and preparation tips. The first kind of questions will be jumbled word sentences which you will have to solve in a way that the whole jumbled sentence or paragraph makes sense. Then the next question will be where you have to fill in the blanks with the most appropriate words, then comes grammar where you have to correct the sentence. Next up will be synonyms and antonyms and idioms. In DU LLB Entrance Exam 2018, I would, first of all, like to recommend the grammar book called Wren and Martin and then a book on vocabulary called Word Power Made Easy by Norman Lewis. Besides the time-consuming task of finishing these books, I suggest that in your free time you read the English newspapers especially the editorial sections. Also, read as much English material as you can, for instance, good novels which challenge your already existing vocabulary. This section should be your most scoring and if you are good at GK or quantitative aptitude then that is like icing on the cake. This is a vast section and covers a major portion of the test with up to 40 questions from here. You will need to cover History, Geography, General Science, Economics, and Indian constitution. Also cover sports, science and technology, arts and literature, finance, major UN bodies, and important dates. Get books like Manorama yearbook, the Pearson's GK Manual and Competition Success. You do not need to read all three but buy them so that when you start getting tired of one book you can switch to another and you get to choose among these three books the pattern which you like the best and the pattern which best suits your learning method and aptitude. Read regular current affairs to build a strong understanding of the surroundings.Gain expertise in this section and your chances of being among the toppers become high because this is not a scoring section. The topics covered are interest, time and speed, time and work, averages, percentages, ratio and proportion, fractions, number system, rational and irrational numbers, natural numbers, HCF and LCM, mean and mode, commercial math and miscellaneous questions on clocks, calendars, probability and sequence and series. I believe the best way to prepare for this section is by taking a look at the past year papers and then coming to the conclusion about which topics need the most attention. Those topics which consist of questions which can be easily solved should be separated from topics which cover questions which need calculation. I am going to recommend you an awesome book which is Quicker Maths by M Tyra which will give you lot of tricks and shortcuts that you can use while solving questions from this section. You should strictly keep in mind that you do not have to spend more than 15 minutes on this section. Some students really have a knack for these questions and they are in luck because of 20 questions from this section. These questions include coding-decoding, direction sense, blood relation, syllogism, critical reasoning, series, Venn diagram, analogy, sitting arrangement, puzzles. The most common book for this section is RS Aggarwal but you could also try Shakuntala Devi's book puzzles to puzzle you. For legal reasoning you would need a good book and then it becomes very scoring and the name of the section rightly suggests that it checks your aptitude. It is my favourite section. Study the book Universal's Publication for DU LLB and SS guide by Anand Prakash Mishra. These will prepare you for legal maxims, legal terms, basic principles of Torts, Contracts, IPC, Jurisprudence, CrPC, CPC, Intellectual Property Rights, and Constitution and questions will also be there to check your aptitude for example when the principle and facts are given and one has to apply the principle to the fact and arrive at the conclusion. Once you are prepared to take as many free sample papers and DU LLB entrance exam past year papers which you can find and sit for the test in a time-bound disciplined manner as if you were appearing for the real paper and practice till you know your strengths and weaknesses and remember that polishing your strengths is as important as working on your weaknesses. 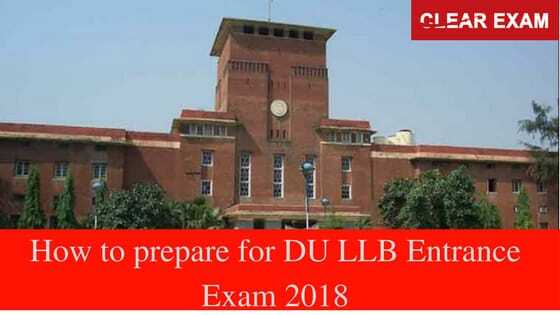 Go through the tips and strategy of du llb entrance exam 2018. Read the topper tips and important books to crack law entrance exam 2018 .